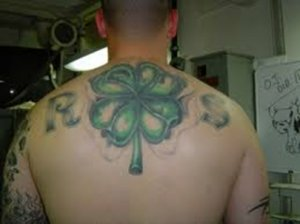 I am sure most of you when getting a specific tattoo have a special or certain meaning as to why you are getting what you are tattooed on you. While others just like what they come across and want it done. Whatever the reason is it is your body and should do it if you like it. As far as different food tattoos are concerned I think again if you like it get it. I do not care what others think of the artwork I have on me because it is not for them nor did they help me get it. On top of that they are not the ones who look at it all day. 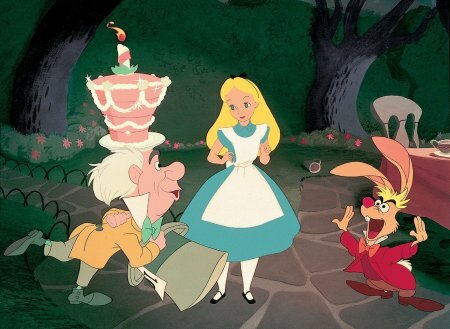 Maybe a certain food has significant meaning to you such as maybe your a chef, cook or baker. It may be a pet name someone calls you or you call someone else or just the fact that you really like that specific food. 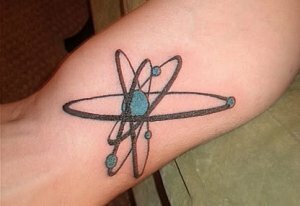 So what ever the reason you may have for putting it on your body then go for it. I will show you some images of different food tattoos that people have on them. 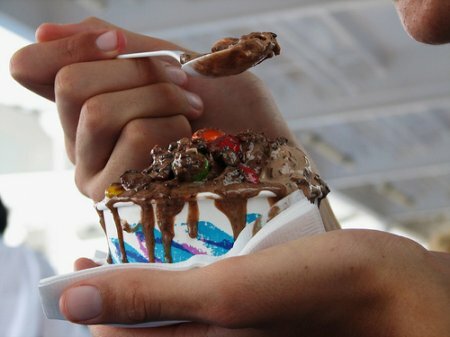 There are a few things you should consider when getting a food tattoo. 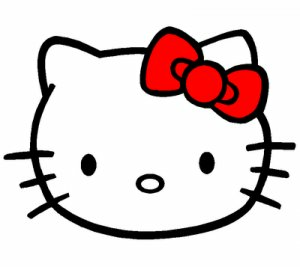 The first is do you want the food to look realistic or like a cartoon. If you want a food tattoo that is real to life you better make sure you have an awesome tattoo artist. It can be hard to make a tattoo of food look realistic. It takes a really talented artist to do so. Second, are you sure you want this food one you for the rest of your life? Sure you may like cheeseburgers or whatever right now but how are you going to feel about them in 20,30 or even 50 years. If you are absolutely positive that a food tattoo is right for you than check out some of the designs below for a few great ideas. This is an eggs and bacon tattoo. The guy has made his head into a plate full of delicious breakfast food. A great thing about head tattoos are if you want to cover them up you can either grow your hair out or put on a hat. Vegetables are probably the least common food tattoo. 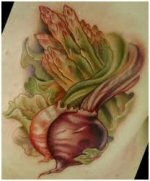 If you decide to get a vegetable tattoo it will certainly be unique and no doubt one of a kind. Meat is a very popular food tattoo design. many people get different cuts of meat or animals tattooed onto their bodies. This food tattoo is clever since it says June Cleaver on the cut of meat. This is an all American food tattoo design. 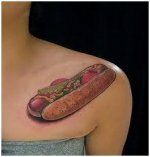 A hot dog tattoo will always remind you of summer and the fun that can be had. 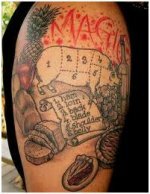 This is a great food tattoo for butchers or chiefs. It shows the different cuts of meat that they would typically use. Meat is a widely used food tattoo. Share a link to a page on Different Food Tattoos and we will consider it for placement on this page.